This illustration of the greater dwarf cloud rat (Carpomys melanurus) was published in 1898 as part of the formal description of the then new species. That description was based on the only other sighting of the mammal in 1896. (Thomas, Oldfield. 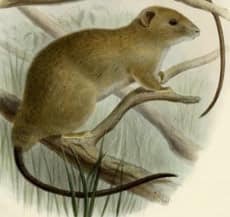 On the Mammals obtained by Mr. John Whitehead during his recent Expedition to the Philippines) Scientists have rediscovered a “beautiful little animal” last seen 112 years ago in the mossy forests of the Philippines and long thought to be extinct. A team of Filipino and American researchers announced Friday they captured a greater dwarf cloud rat in the Philippines’ Mount Pulag National Park. The little mammal weighs about 185 grams and has dense soft reddish-brown fur, a black mask around large dark eyes, small rounded ears, a broad and blunt snout and a long tail covered with dark hair. Over the spring, Heaney’s team conducted the first comprehensive survey of the small mammals in the mossy, or cloud, forests of Mount Pulag National Park. Their findings included the dwarf cloud rat, a smaller relative of the giant clouds rats, mammals found only on Luzon Island, in the Philippines, but widespread and comparatively well known. Danilo Balete, the project’s co-leader with the Philippine National Museum, spied the rat in a patch of mature mossy forest high on Mount Pulag, at about 2,350 metres above sea level. It was in the canopy of a large tree, on a large horizontal branch covered by a thick layer of moss, orchids and ferns, about five metres above ground. “We had suspected from its broad, hand-like hind feet that it lived up in big trees, but this is the first evidence to confirm that,” said Balete. Because this is the first time the dwarf cloud rat has been seen in its natural habitat, scientists will study the mammal in depth to figure out how they evolved and how to keep them around. “Finding this animal again gives us hope for the conservation of one of the most diverse and threatened mammal faunas of the world,” said William Stanley, collections manager of mammals at the Field Museum. Much of the mossy forest in Mount Pulag National Park where the biologists found the dwarf cloud rat was logged during the 1960s, and few large trees remain. The mossy forest has been gradually regenerating, but many local people now have vegetable farms there and some of the mossy forest has disappeared as a result. The research team suspects the rat lives only high in the big canopy trees in mature mossy forest, at elevations from about 2,200 to 2,700 metres, high in the mountains of the Central Cordillera.